Your front door is the main entrance into your home — and your personal style. Sure, windows, landscaping, and decorations also add character and curb appeal. But your front door is where your guests’ eyes are focused as they stroll up to your house, and the last thing they see as they walk out. If you’re looking to add a touch of style or a pop of color to your home — without the cost of a major renovation — a new door can help you make a strong statement. At Pella, we see every day how a new door can transform the look of any entry with all the projects our dealers and customers share. Here are five of our favorite Pella projects to inspire your front door makeover. The previous door on this seven-year-old Lexington, KY, home was dark and difficult to open. By upgrading to an oak grain fiberglass double door with glass and a red mahogany stain, the homeowners created a more inviting entryway that no longer blended in with the bricks. This Dallas homeowner wanted to make a statement. Mission accomplished. She transformed a standard single front door design with sidelights into a breathtaking, custom wood double door. With a Chicago brick home nearing the century mark, the homeowners wanted to ditch the dated look, but keep the classic feel. They picked out a standard Craftsman Style wood entry door and had it custom fit for their 90-year-old home. This Lincoln, NE, homeowner wanted a distinctive new look for their front entrance. They loved the look of wood, but worried about the maintenance. 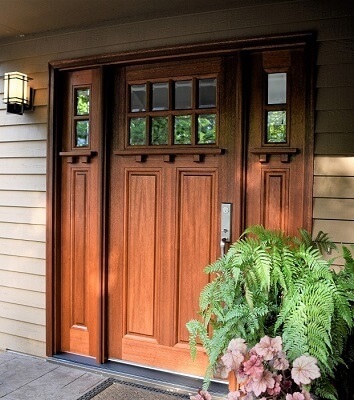 This low-maintenance wood grain fiberglass entry door fit all their needs. This Redmond, WA homeowner just wanted a new look. Updating nothing else, a mahogany door and sidelights added sophistication and elegance to their entryway. Feeling inspired? Check out your options to transform your front entry with wood, fiberglass, and steel entry doors from Pella. Or bring in your own entry door inspiration to customize a new door to your unique tastes.